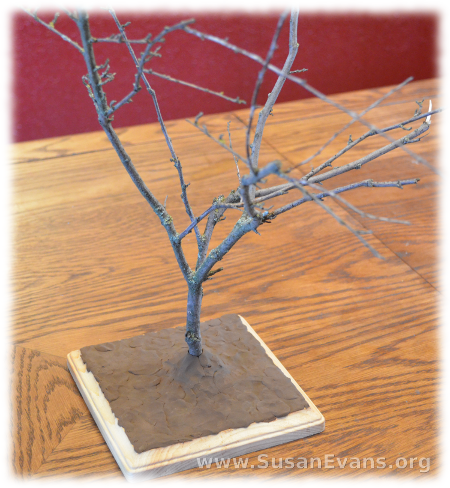 If you are teaching the book of Genesis or Revelation to your children, you can make a beautiful Tree of Life craft. The Tree of Life is mentioned in Genesis as having fruit that allowed a person to eat of it and live forever. This is why God placed angels guarding the way to the Garden of Eden, so that Adam and Eve would not have eternal death, since they had already chosen to eat from the Tree of Death, or the Tree of the Knowledge of Good and Evil (Genesis 3:22-24). Eating from the Tree of Life at that point would have caused eternal separation from God, not allowing them to be redeemed. In Revelation, this tree appears again in the New Jerusalem, and its leaves bring healing to the nations (Revelation 22:2). This is truly a remarkable tree. 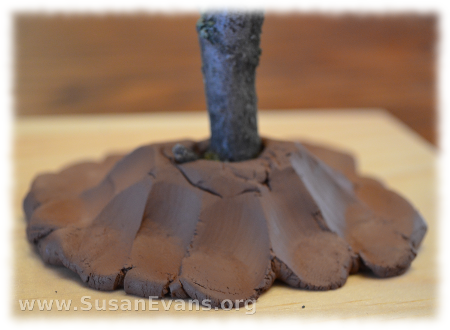 Attach the branch to the base with the clay. Use the clay to cover the entire base. I got this square base at Hobby Lobby for $2, but you can use any scrap of wood from your garage. Hot glue brown ribbon around the base, to give the base a finished look. I used thick sparkly ribbon left over from a turkey candle we made last year for Thanksgiving. You could also paint it with gold paint instead, if you have that on hand. Finally, you will want to hot glue some fruit to the tree. If you can find some apples just the right size, you could hang these on the tree. I couldn’t find any, so I used red pompoms. Your Tree of Life craft is now complete. Sign up below for a free printable e-book of this Bible crafts series! 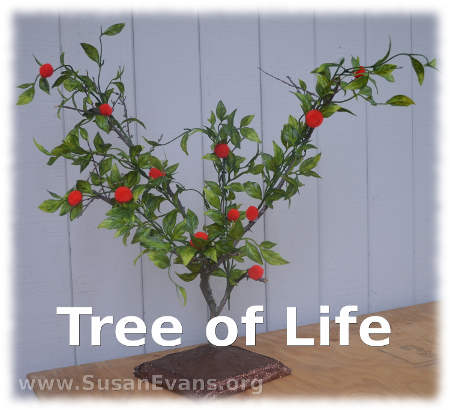 If you enjoyed making this Tree of Life craft, you will love Using Simple Costumes and Props to Teach the Bible. You receive this 2-hour video for free when you sign up for the Unit Study Treasure Vault, which has an enormous Bible section! This entry was posted on Wednesday, October 30th, 2013 at 8:00 am	and is filed under Bible. You can follow any responses to this entry through the RSS 2.0 feed. You can skip to the end and leave a response. Pinging is currently not allowed. This is a great idea to share for the upcoming holidays. I can even see this idea as table decoration for events. 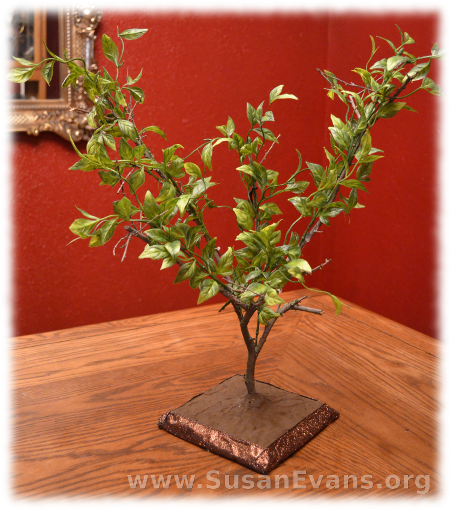 Yes, I’ve decorated a table tree for the different seasons. That can be a cute centerpiece!